I’ve done my best to compile as many free PDF patterns as I can find, and share them here for all of you. I’ve sorted them into type, and then they are alphabetical by designer. Some patterns are completely free, some will be sent to you after you sign up for a newsletter, and some are only free if you join the designer’s Facebook group for a code. Bella Sunshine Designs Reagan Raglan – Join the Bella Sunshine Designs Facebook group, and check the pinned post for a code to get the pattern for free. I’ve made and blogged this pattern here. Love Notions Classic Tee Shirt – For a limited time only, until September 30, 2018 fill out a short survey to receive a coupon code to download this pattern for free. Survey linked on pattern purchase page. New Horizons Key West Tank for Women – Join the New Horizons Facebook group, and check the comments of the pinned post for a code to get the pattern for free. I have made and blogged about this pattern here. Winter Wear Designs Cross Hem Tee – Join the Winter Wear Designs Facebook group, and check the pinned post. There is another post with the code, but the pinned post has instructions on finding it. Winter Wear Designs Trendy Tank – Join the Winter Wear Designs Facebook group, and check the pinned post. There is another post with the code, but the pinned post has instructions on finding it. 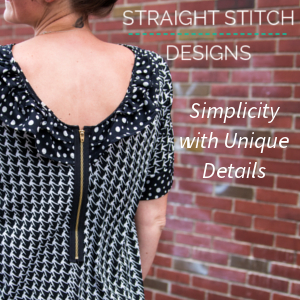 George & Ginger The Sincerely Rylee Dress – The code to get this pattern for free is split between two groups, so you have to join both the George and Ginger Facebook group and the Sincerely Rylee Facebook group, and check both pinned posts. Winter Wear Designs Alpine Fingerless Gloves – Join the Winter Wear Designs Facebook group, and check the pinned post. There is another post with the code, but the pinned post has instructions on finding it. Winter Wear Designs Animal Scarves for Kids and Adults – Join the Winter Wear Designs Facebook group, and check the pinned post. There is another post with the code, but the pinned post has instructions on finding it. Winter Wear Designs Kids PJ Pants – Join the Winter Wear Designs Facebook group, and check the pinned post. There is another post with the code, but the pinned post has instructions on finding it. Violette Field Threads London Dress – Join the Violette Field Thread Facebook group, and check the pinned post for a code to get the pattern for free. They also have more free patterns/tutorials here. Winter Wear Designs Dragon and Unicorn Pillow – Join the Winter Wear Designs Facebook group, and check the pinned post. There is another post with the code, but the pinned post has instructions on finding it. Winter Wear Designs Unders – Join the Winter Wear Designs Facebook group, and check the pinned post. There is another post with the code, but the pinned post has instructions on finding it. Winter Wear Designs Magnolia 18in Doll Pattern – Join the Winter Wear Designs Facebook group, and check the pinned post. There is another post with the code, but the pinned post has instructions on finding it.